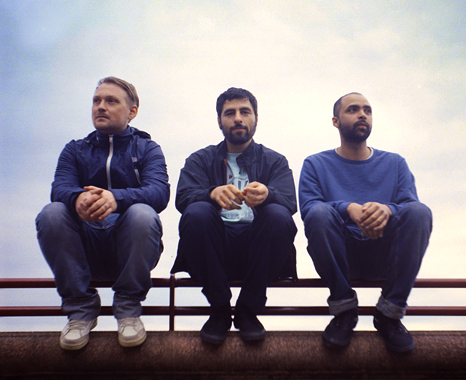 The story of Swedish trio Junip is the story of two childhood friends, José Gonzalez and Elias Araya, who had already known each other and played music together for years when they met Tobias Winterkorn and asked him to join the band, some time around 1999. Then followed their first 7-inch “Straight Lines” in 2000 and the self-released Black Refuge EP in 2006. Fast forward to 2010: Junip’s first full-length album finally sees the light of day and is released internationally on September 14, ten years after their debut single! There are many reasons for this unusually lengthy genesis: Araya decided to studied art in Finland and Norway from 2001 to 2005, Winterkorn worked part time as a teacher, while spending his spare time building a studio for his own recordings, and Gonzalez launched a successful solo career, which culminated in the international release of his debut album, Veneer, in 2005. Junip still periodically met up, schedules permitting, to record new tracks and exchange ideas. They would improvise together, looking for a nice groove or melody, recording what they played and then selecting what they could keep and what had to go. While frustrating at times, this protracted creative process also allowed the artists to mature and get to know each other musically. With their perfectionism and persistence, Junip have crafted songs that are powerful and dynamic and yet subtle and intimate, 11 tracks built around Winterkorn’s analog keyboards, Araya’s hypnotic beats and Gonzalez’s unmistakable voice. These songs combine influences ranging from folk-jazz to psychedelic soul, krautrock and afro-beat. This is an album to savour and immerse yourself into from the first minute to the last.